Pursuant to articles 13 of EU 2016/679 Regulation, as well as according to the provisions of the General Provision of the Guarantor for the protection of personal data n.229 / 2014 of the May 8, 2014, Frantoio F.lli Paolocci Srl, data controller, provides through this information extended to visitors of this site some information about the cookies used and how to deactivate them. The information is provided only for the site www.frantoiopaolocci.it (hereinafter the site) and not for other websites consulted by the user through links, for which reference is made to the respective information/policy. In the case that the visitor of the Site does not agree with the content of this statement, he is invited to disable cookies, before continuing with navigation, following the instructions in the paragraph "MANAGING OPTIONS ON COOKIES & rdquo ;. This information may change over time by virtue of any additions or changes to laws and regulations and by virtue of updates to the contents and functionality of the Site. Visitors to the Site are therefore invited to consult and periodically check the information. Cookies are text files that store information about the device used by the visitor for browsing (on his hard drive, on his tablet, on his smartphone or on the browser used). For the Website, the cookies act as a memory allowing, at the site itself, the recognition of the device used by the visitor at every access: they simplify the preservation of preferences and, detecting the technical methods of use of the Site, allow to further improve the functionality and the general usability. The computer systems and software procedures used for the operation of the Site automatically acquire certain information concerning web browsing, the transmission of which is implicit in the use of internet communication protocols. On the Website, these data are used for the sole purpose of obtaining anonymous statistical information on the use of the Website itself and to check its correct functioning. Session cookies are used only for the duration of the session of the browser used. Cookies are used to collect statistics on visitors and to record information about preferences while browsing the Site. Our purpose in using cookies is to improve the experience offered by our site to visitors. The Website uses both first-party cookies (or the owner's cookies) and third-party cookies. First-party cookies are technical cookies only, while third-party cookies can be both analytical cookies and profiling cookies. The Website uses technical cookies with respect to which, pursuant to art. 122 of the Privacy Code and the Provision of the Guarantor n ° 229/2014 of May 8, 2014, no consent is required from the interested party. The Site allows the setting of Third Party cookies. These cookies are not under the control of the owner of the treatment of the Site as set directly by the operators of the Third Party websites and used for the purposes and in the manner defined by them. Here is more information about the Third Party cookies used. These cookies are configured and used to collect information in an anonymous format and to analyze some aspects of browsing our site; for example, the most visited pages, the level of statistical interest in aggregate form in relation to the use of the website visited. The integration of the Site with the social networks allows them to acquire the data relating to the visit on the Site. The social networks acquire data relating to the visit also by clicking the relevant icons on the Site. Therefore, through the integration with the Site and through the use of icons, social networks install third-party cookies that can also perform more or less anonymized profiling procedures. However, the Site does not share any navigation information or visitor data with social networks. To prevent monitoring by social networks, it is necessary to close the sessions of the social networks which access has been made before visiting the Site. The site uses Add This, which allows you to add and manage the buttons of some social networks to allow visitors to share content on various social platforms. The use of these sharing buttons involves the installation of cookies, including profiling cookies, of the third-party company that offers the service. The visitor can refuse, disable cookies from your browser and/or delete all cookies that are currently saved on his device by intervening in the settings of his web browser. Please note that changing cookies settings on browsers may prevent the possibility to fully take advantage of the Website features. Each browser has different procedures for managing settings. Below are the main browsers used, with the addresses where to find information to change cookie settings. The deactivation of third-party cookies is also possible through the methods made available directly by the companies in charge of said processing, as indicated in the links above. The permanence of cookies depends on their nature. Session cookies expire when the user closes the browser; persistent cookies have variable expiration dates that typically vary from a few hours to several years but that typically, except for special exceptions, do not exceed 20 years. The treatment will be carried out with tools automated by the owner. No dissemination or communication is made. The provision of data is returned to the will of the interested party who decides to browse the site after having read the brief information contained in the appropriate banner. The following General Conditions of Sale discipline the offering and sale of products on the e-commerce website Frantoio F.lli Paolocci srl. The offer and sale of products on this website are governed by these General Conditions of Sale; sending the purchase order implies that you are fully aware of, and expressly accept, these conditions and the terms on the Order Form. The Customer will accept the General Conditions of Sale by checking the box at the end of the ordering process. All purchase orders are subject to acceptance by Frantoio F.lli Paolocci; the automatic response the Customer receives after the checkout is the receipt of the purchasing; the orders must be complete in every part to be processed. The order will be confirmed by the Customer when Frantoio F.lli Paolocci will receive the total amount paid via one of the methods of payment indicated in the website. - Partial or entire replacement of same value goods, agreed with Frantoio F.lli Paolocci. The prices of the goods in the website are in Euros and include VAT. Shipping rates will be expressly and separately indicated in the order form. The amount varies with the weight or the destination of the goods. 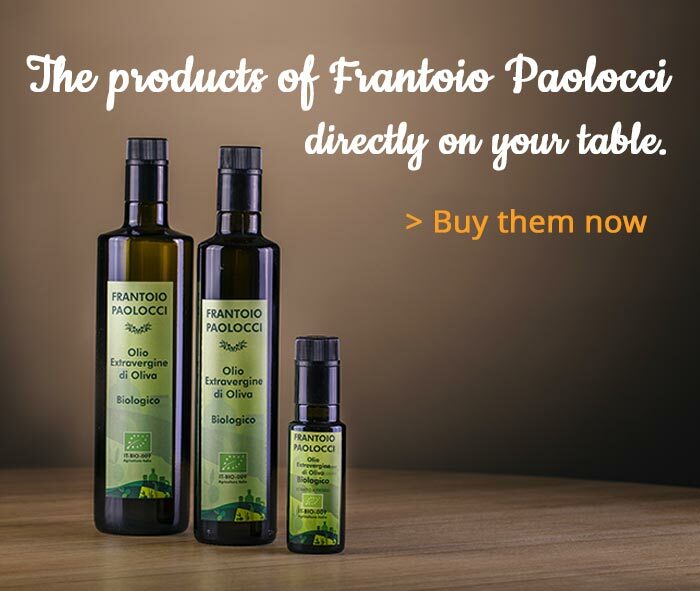 Once the payment has been received, Frantoio F.lli Paolocci will deliver by courier the goods ordered by you to the address you give us in the moment you make your order. If the goods cannot be delivered due to the absence of the consignee, the courier will leave an attempted delivery notice. The Customer will have to contact shortly the courier or Frantoio F.lli Paolocci to rearrange a new date and time for delivery. Courier will only delivery at street level; therefore it will be the Customer's responsibility bringing the package to a specific floor. We are not responsible for lost or damaged packages for reasons of force majeure. The Consumer has the right to withdraw the goods within ten days after receiving the order, if not satisfied with products purchased. In this case the Customer must send an e-mail with the cancellation of the order and return all the products received, under his/her care and expenses. The Customer can exercise the right of withdrawal within ten working days from receipt of the ordered goods if he/she will not satisfied with the purchase made. In this case it must communicate the cancellation of the order by e-mail and return the products received under his/her care and expenses. The only expenses charged to the Customer are those concerning the return of the ordered products, well packaged and not damaged, to the headquarters of Frantoio F.lli Paolocci. Under penalty of expiration, the right of withdrawal must be exercised by registered letter with return receipt, attaching a copy of the purchase document and the bank details for the refund. In case of withdrawal, Frantoio F.lli Paolocci will immediately, and within 10 working days after receiving the registered letter, refund the Customer with the whole amount by bank transfer. - Products not delivered due to the absence of the Customer to the specified address indicated on the purchase order form. The contract between us shall be governed by and interpreted in accordance with Italian law and the Italian courts shall have jurisdiction to resolve any disputes between us. For matters not expressly disciplined herein, reference shall be made to the Legislative Decree 6/9/2005 n.206 (Consumer Code). you can find our store where you can buy our oil!